While attending a recent conference in Manchester on the best commercial practices and the future of search, analytics and social for the digital community, I watched a panel discussion that examined the role women play within the industry. Following a recent report revealing men are 156% more likely to be in management in our sector than women, the discussion was centred on why this is the case and how we can change this. 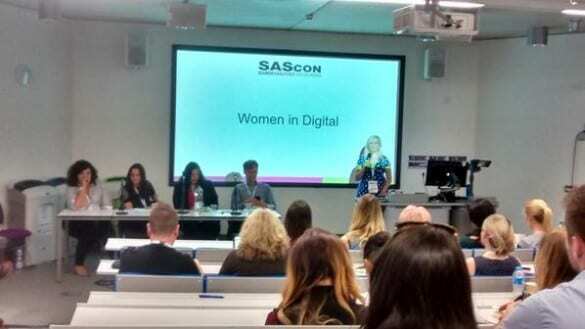 The aptly named Women in Digital session at SASCon 2015 featured an almost entirely female panel, with three of the four debaters being women business leaders in the industry. Over the hour-long discussion at Manchester Metropolitan University (MMU), a number of areas were touched on, from education and work-life balance to society in general. The research by marketing recruitment firm The Candidate, titled ‘Women in Digital: a study into the gender representation in today’s thriving digital industry’, formed the starting point of the debate. The study revealed a number of key insights that were discussed at length by the panel, including 43% of female professionals within the digital sector earned less than £20,000 per year, compared to only 24% of male workers, while twice as many men are working within the industry. The study was conducted by polling 150 UK companies and it was found that only 18 of these digital enterprises were headed by women. Also, around 80% of the top salaries within this industry were found to go to men. The issue of how women are treated within schools came up a number of times, with the consensus being that British education was lacking overall when it came to digital-focused lessons. While it was suggested that this may eventually lead to a UK-wide skills gap for men and women, it was also noted that many female students may feel alienated from certain topics, such as coding. Personally, I do feel many women – and actually some men as well – believe the world of online marketing to still revolve mainly around ‘development’ and being able to code a website. But as the importance of content has taken over, and the industry matures, more and more roles are being created that don’t require this at all. This in itself should encourage more women into the industry. It was also brought up that only 10% of women working within the digital sector had completed an apprenticeship, which it was argued showed that we are not finding an easy access route into the field. The panel went on to ask whether the digital sector itself could be making it harder for women to prosper, especially as it has developed from a technological calling that was fairly male centric. It was even suggested that the wording of the study could be slightly biased in this regard, as it referred to the areas in which women are excelling as “soft skills”. The sector was also described as a “small world”, which could discourage some women from speaking out when discrimination does occur, as they would not want to be tarred as a troublemaker. It was here the panel suggested that this was a problem with society at large, noting that we may just need more confidence to start asking for what we have proved we deserve. For example, the issue of asking for raises was brought up, with it suggested that as men are more likely to ask for them, their pay may increase at a higher rate than ours as their careers advance. The panel also discussed the importance of coaching, noting that mentors would not even have to be other women. One panellist revealed that one of the earliest positive influences she had in her career was a male boss, who would prompt her to ask for challenging projects and raises. Establishing or joining groups for female entrepreneurs and professionals was recommended, as not only a way to help with confidence, but also networking and for help in developing career strategies. How we make the most of our careers and home life was naturally a point, especially with regard to maternity issues. It was here again that coaching was suggested, as it was felt that some of us can lose confidence while on maternal leave, making us wonder how we could possibly come back to work. Along with proper mentoring, remote working was suggested as a way to help with workplace flexibility, which it was noted could assist with recruitment, retention and a quality work-life balance within the digital sector. A brief look around the lecture hall at MMU showed that around a third of the attendees were men, with the panel arguing that working together would be the way forward. Overall, it certainly seemed to me the debate could have easily gone on all day, such is the importance of the issue. However, just having more women talking about these issues openly, along with additional studies, is great for the industry at large.